A 56-year-old Brea man was booked Thursday on suspicion of assault with a deadly weapon after allegedly driving through protesters outside the office of California Republican Rep. Ed Royce. Daniel Wenzek was accused of driving a 2013 Toyota Avalon through a line of about 200 protesters at Birch and Brea boulevards about 1 p.m., Brea police Lt. Darrin Devereux said. After being booked, Wenzek was later released pending results of the investigation. Wenzek was driving west on Birch at Brea when he leaned on his horn and slowly drove through a line of the activists, according to police and video of the incident provided by protesters. Some of the protesters jumped on the hood of the car and banged on the vehicle before police intervened, circled the car and made Wenzek stop and exit the Toyota. No one was seriously injured, Devereux said. But the SEIU United Service Workers West union, which helped organize the event, later released a statement saying six people were taken to a hospital for evaluation. The protesters did not stick around to file police reports so investigators encouraged any victims to call officers. One of the protesters, Andrew Cohen of Unite Here Local 11 labor organization, said he saw the incident developing and was frightened it would be a deadly confrontation similar to the one in Charlottesville, Virginia, in which a car plowed into a group protesting the gathering of hundreds of white nationalists, leaving one woman dead. "That was the first thought that was on all of our minds," Cohen said. "I think he was trying to get through the crowd," Lt. Adam Hawley said. "We don't have any indication he was trying to harm somebody." Several hundred activists started their day at MacArthur Park in Los Angeles to hold a news conference on issues related to Temporary Protected Status for many residents from Central America, Cohen said. The activists are concerned the Trump administration will roll back TPS for immigrants from El Salvador, Honduras and Nicaragua. Many of the activists then boarded buses in a caravan to Royce's office to encourage him to resist stripping residents of TPS, he said. "They boarded buses to deliver handwritten notes to Congressman Royce's office with the hope of pushing Royce to preserve TPS, but also to create a permanent solution," Cohen said. Royce's staff, however, "refused to meet with us and we led a march that took over the intersection right by his office," Cohen said. "An irate driver attempted to drive through the line of protesters causing some to jump on the car to try to slow him down, and then the police circled the driver and pulled him out," Cohen said. Some of the protesters suffered "bumps and scrapes," but were not seriously hurt, he said. 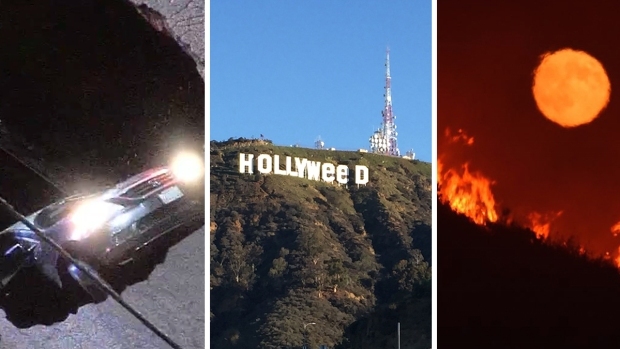 "The whole thing was pretty terrifying," Cohen said. Cohen said he was most concerned about the mothers who had small children in strollers at the event. Royce's staff is usually "combative" when protesters go to his office, but some members of Unite Here ran into Royce as he was in Sacramento recently and he was much more approachable and invited them to visit with him at his congressional office, Cohen said. 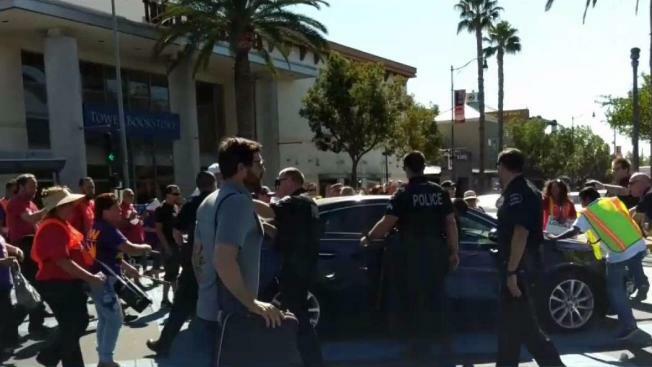 The Brea Police Deparment issued a statement Friday about the agency's response, noting that commenters on social media questioned why the protesters were not arrested before the driver entered the intersection. Police said officers declared an unlawful assembly and were communicating with event organizers about a dispersal order. "The demonstration's organizers were already in the process of clearing the protestors from the intersection when the motorist decided to enter the intersection and drive through the crowd," according to the police statement. "At the time of the incident, several demonstrators had cleared the intersection and were standing on the sidewalk. "In regards to the motorist, although he had a green light to proceed into the intersection, he cannot do so until it is safe. It was clearly not safe and he endangered several peoples’ lives by his actions. From our perspective it appeared the protestors did not start banging on his car until he started driving through the crowd. However, the case is still under investigation, and we are still attempting to locate witnesses, victims and other evidence (video, etc.). We will also be examining whether some of the protestors’ actions were criminal and, if so, take the appropriate action."